I do normally like to research and plan at least a little bit before I travel or go on an adventure, but for some reason leaving things open ended felt right this time. I believe very strongly these days in making and leaving space in my life rather than overscheduling and overstimulating, so maybe that sort of headspace is where I was coming from. 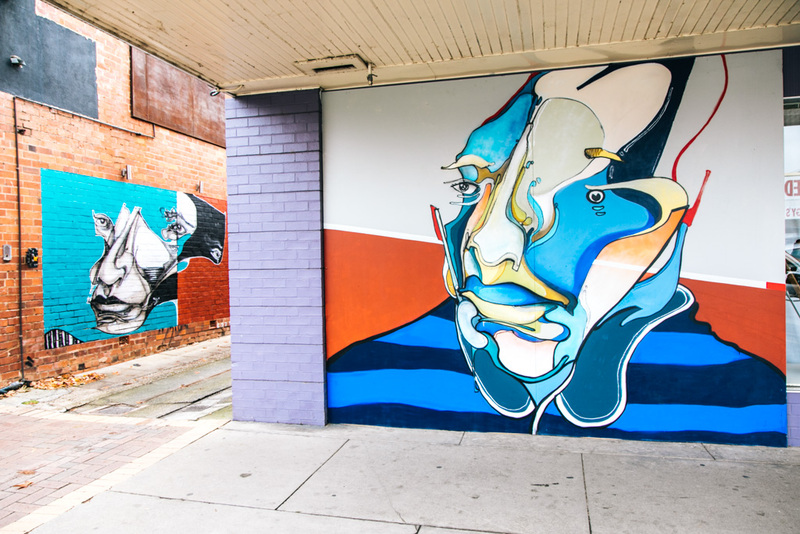 I’m so glad I gave myself that space and allowed for spontaneity because otherwise I probably never would have found out that there’s a boatload of street art and murals up in the High Country. Who knew?! 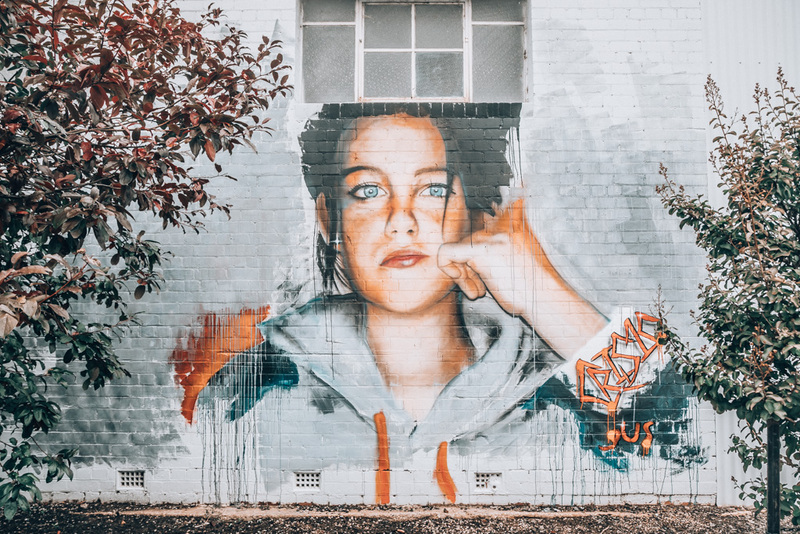 The day I decided on my road trip destination, I met up with a street art-loving friend of mine in Melbs and she told me about a town up north called Benalla that’s known for its annual street art festival. And even better: Benalla was literally on the way to Bright and the other High Country towns I’d be heading out to explore. It could not have worked out more perfectly! 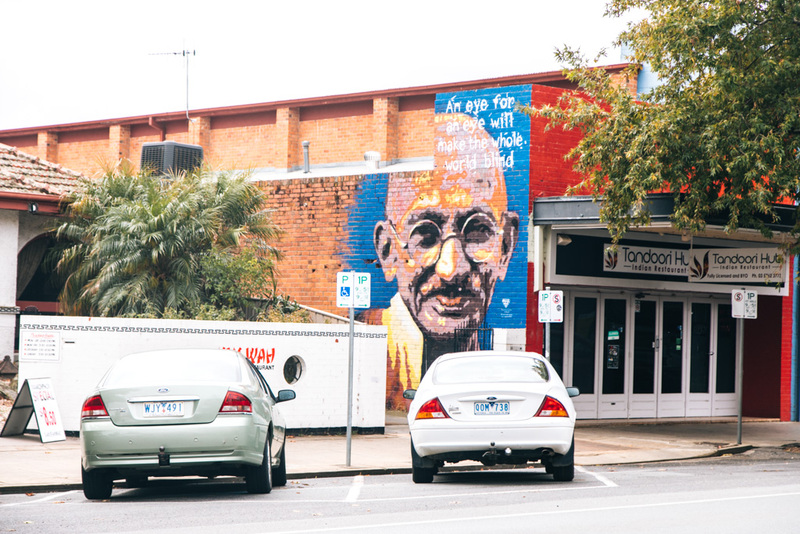 I actually ended up stopping in Benalla on my way back to Melbourne, on the last day of my road trip. The night before, I was browsing the WikiCamps app on my phone to find a spot to camp near town and noticed that one of the campsite listings had a bunch of comments thanking the owner for telling them about the silo art in Victoria right nearby. Silo art?? 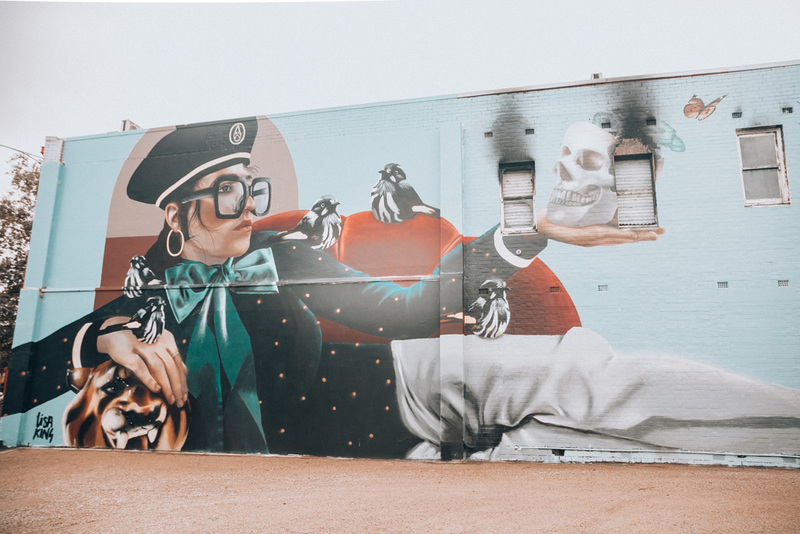 I’d heard about the silo art trail on the other side of Victoria, and in fact it was one of the options I’d been debating between for this road trip. I took to Google Maps and typed in “silo art Victoria”, and lo and behold, a few entries popped up nearby. Well then! 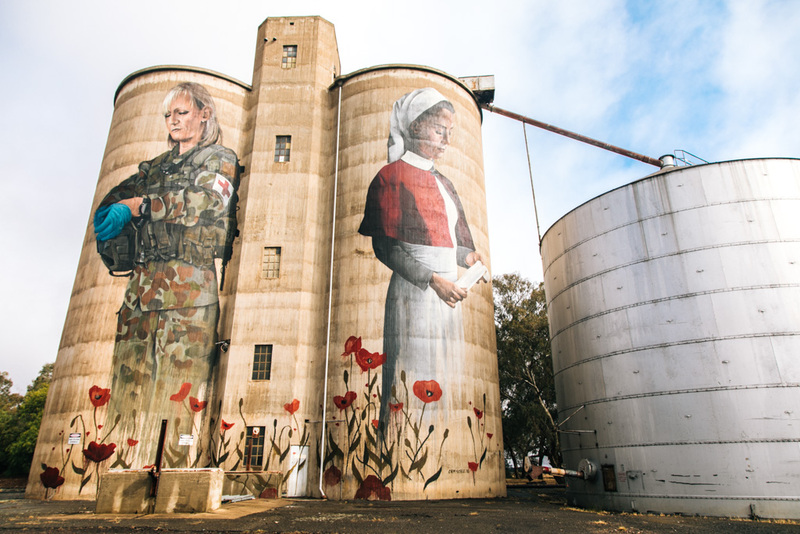 Touring these painted silos in Victoria and then wandering around Benalla would make for a solid half day of street art frolicking. Tungamah is about 40 minutes north of Benalla. 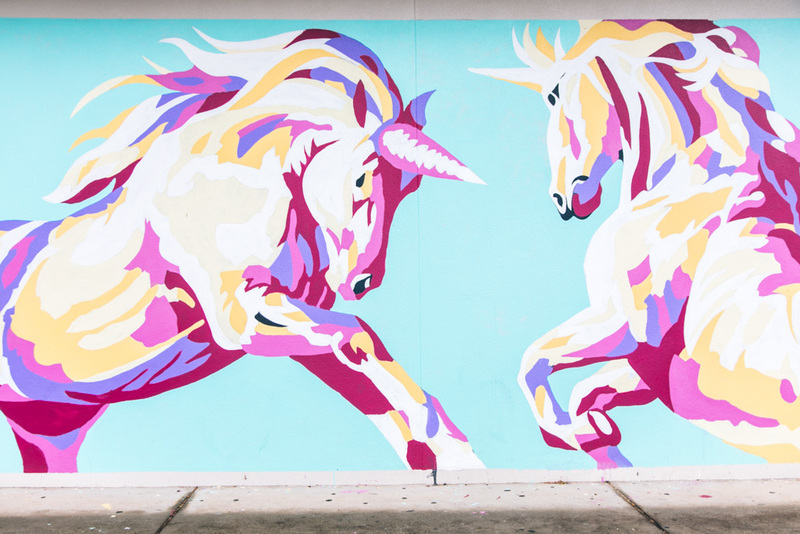 I don’t think the murals are completed yet, but so far they’re looking pretty rad. There’s no information posted about the art, just a sign asking for donations so that the artist can finish his work. Devenish is about 25 minutes north of Benalla and, if I recall correctly, I saw a sign while entering the town that cited a population of 93. 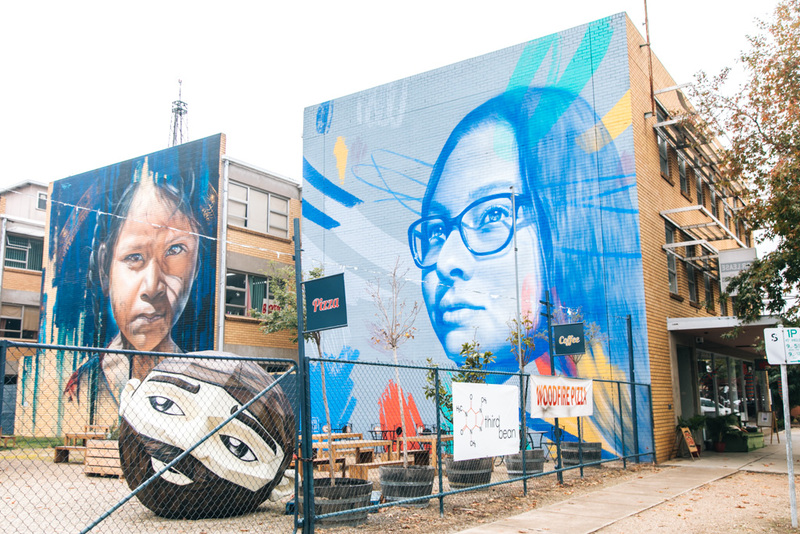 The street with the silos consisted of a line of run-down, unoccupied buildings that once were news agencies, milkbars, and pubs. Oh rural Australia. This artwork is a visual tribute to the 50 young men and women from the Devenish community who enlisted in military service in the First World War, focusing on the role of nurses in service and how that role has evolved over time. 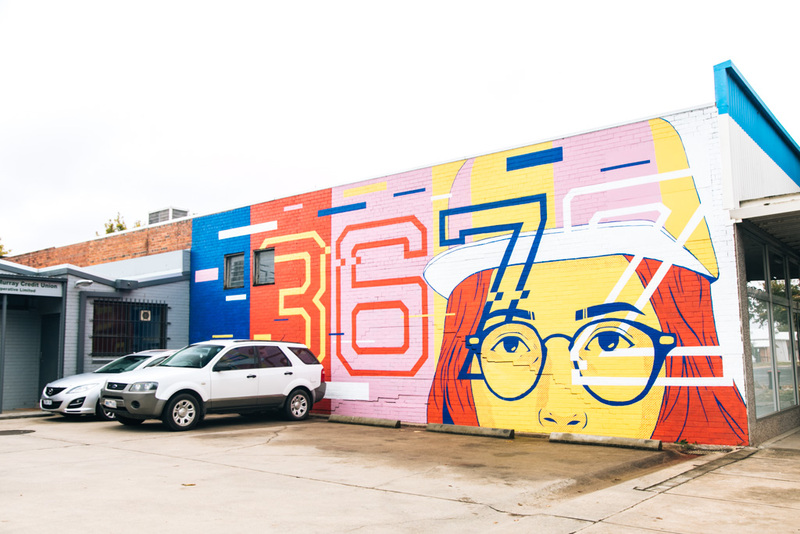 The artist is acknowledging both the historical nurse, modern day medic, and the broad role women now fulfill, caring for military and civilians during wars and national disasters, including peace keeping and humanitarian operations. 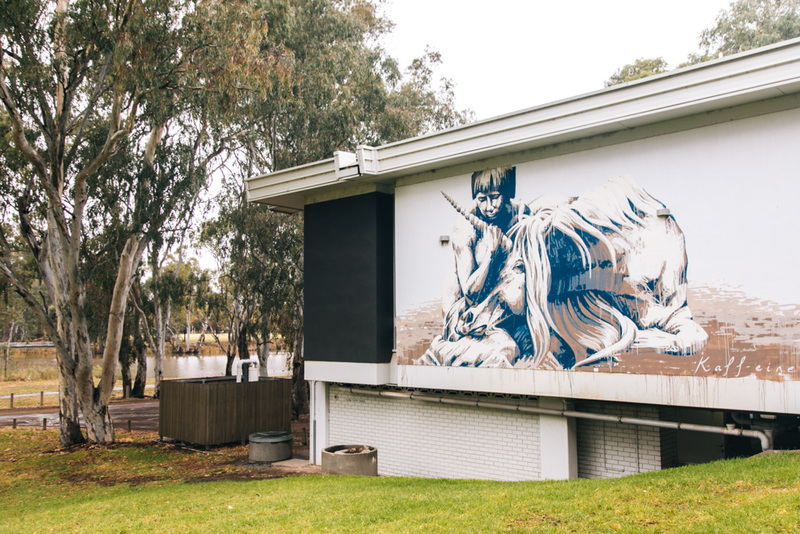 Goorambat is about 20 minutes north of Benalla and has both silo art and a mural inside a church. 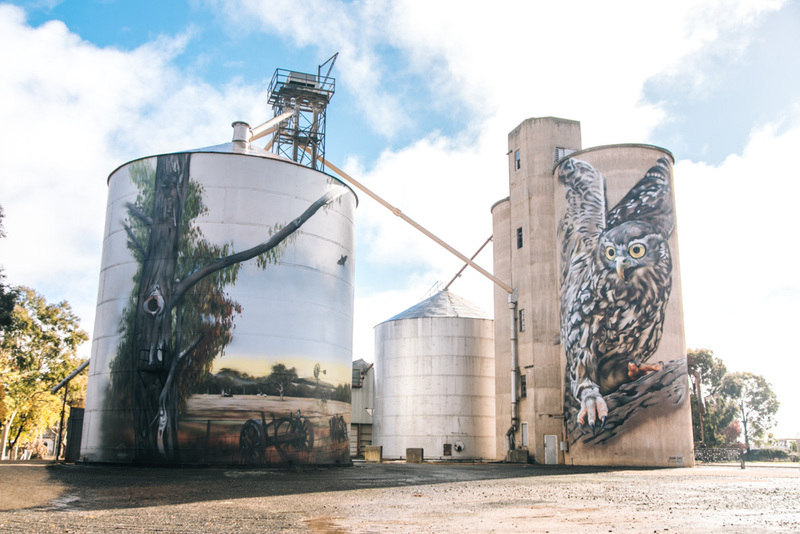 The silos depict a barking owl, an endangered species and also the most threatened owl in Victoria. 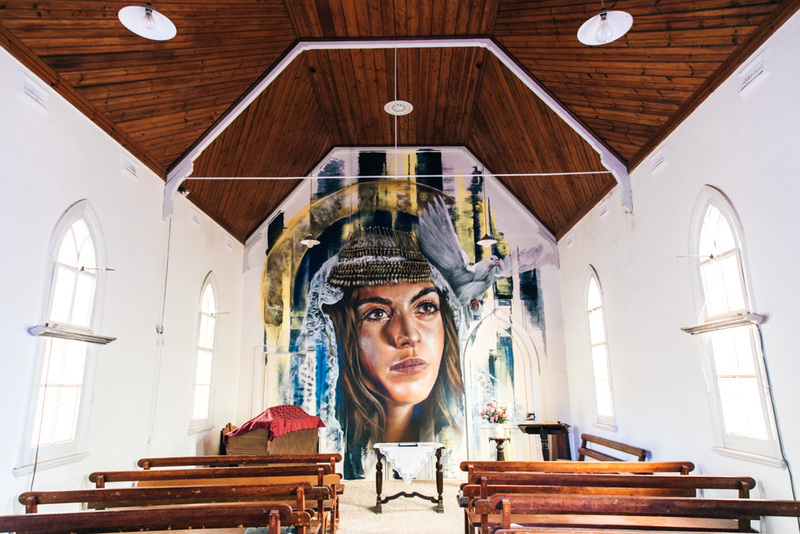 The Uniting Church in Goorambat houses a mural of Sophia, the “personification of divine wisdom in the Old Testament,” behind its altar… and it is a stunner. There is just so much detail in it. 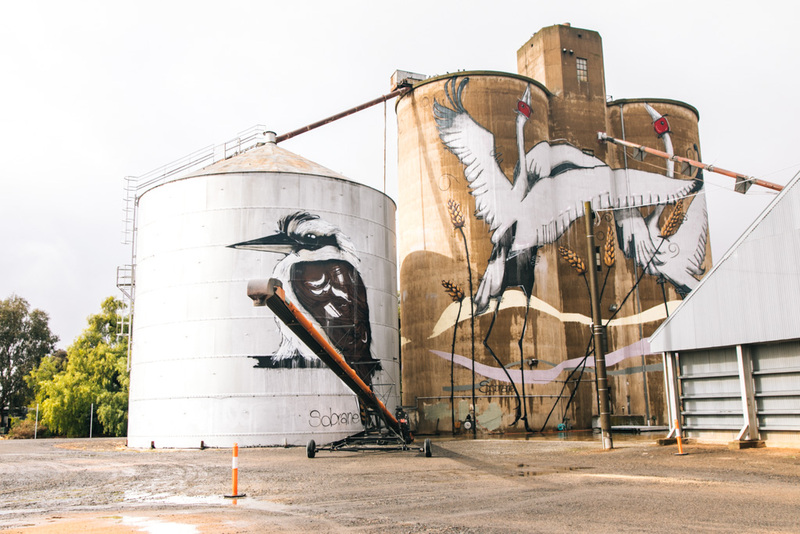 One really awesome side effect of this silo art in Victoria is that it’s helped stimulate the local economy. 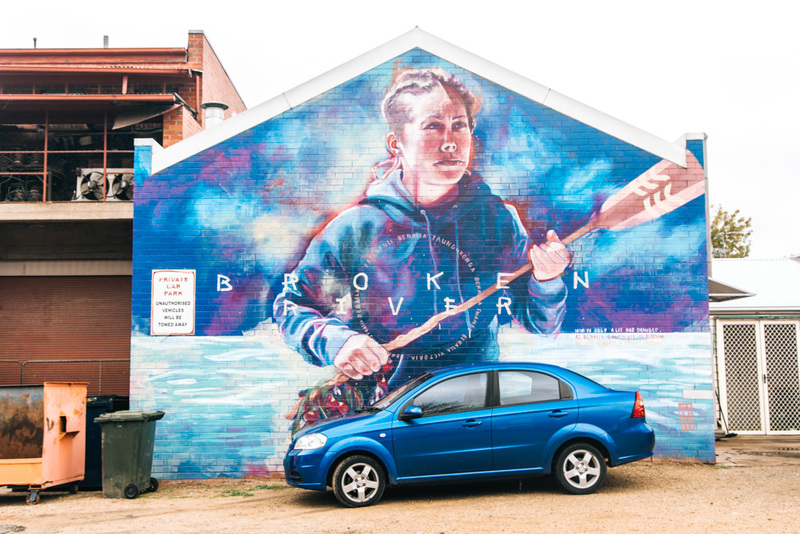 People who are following the silo art trail from Benalla are spending money in these small towns, stopping into the local pubs for a bite or a drink before carrying on exploring the rest of the silo art in Victoria. 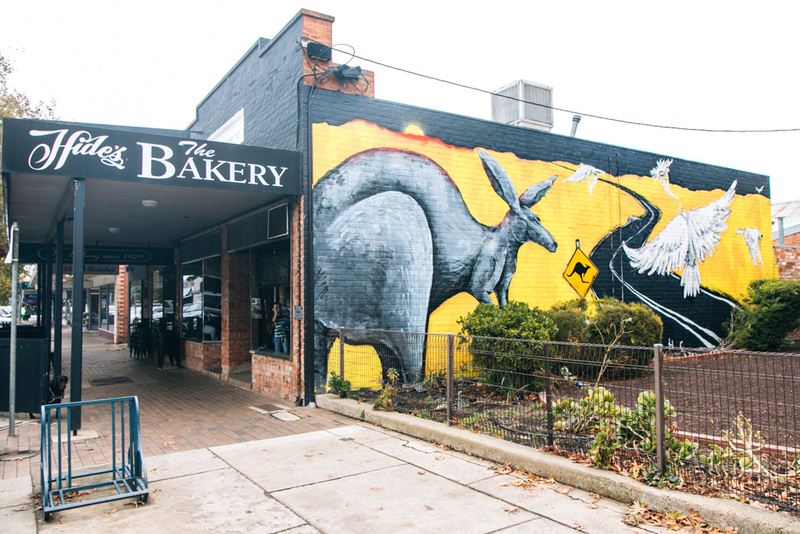 Pretty cool considering pre-silo art, these establishments were mostly dead on weekdays. 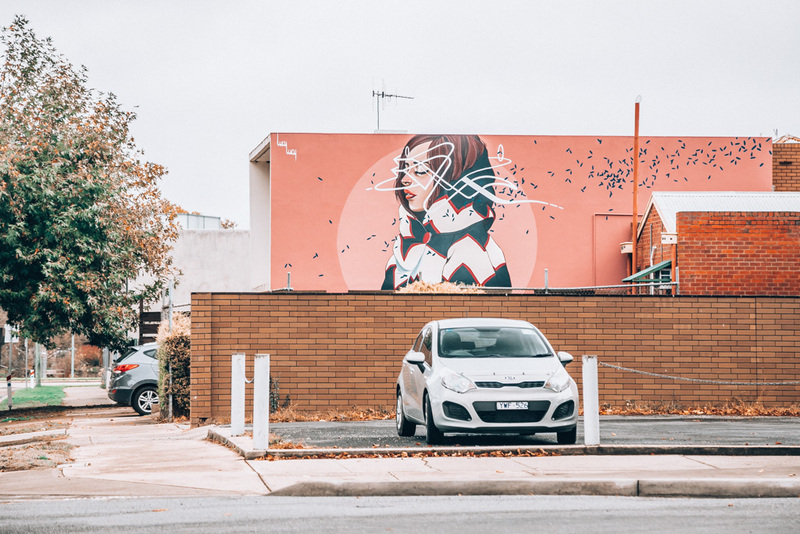 After hitting up the painted silos, I drove down to Benalla for Round 2 of my street art frolicking in the High Country. 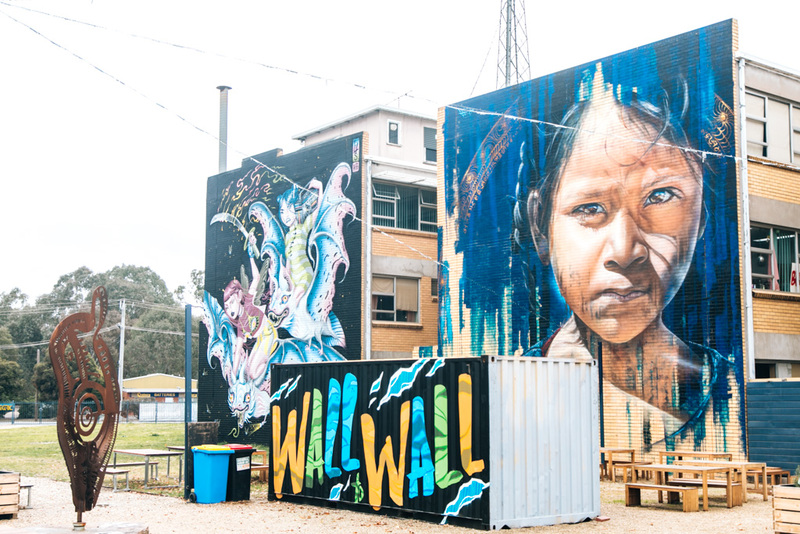 The Wall to Wall festival is held annually over a weekend in March in Benalla, which is about a 2.5 hour drive north of Melbourne. 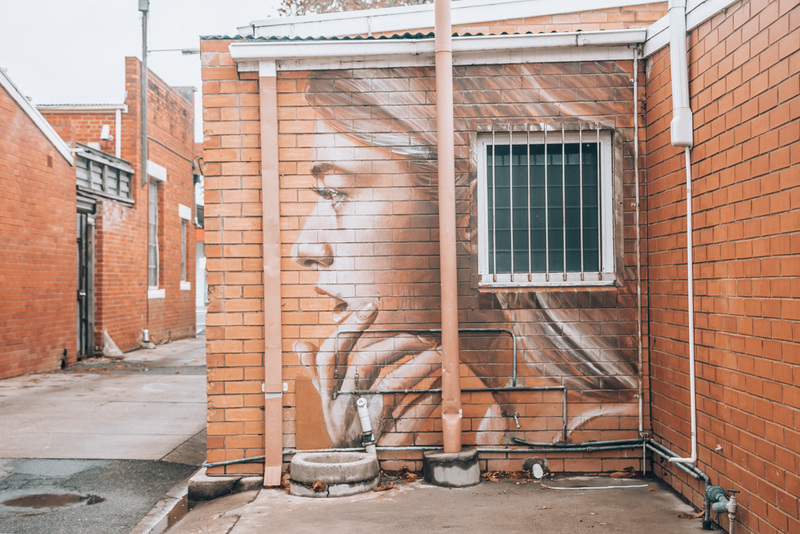 During the festival, people come to watch street artists from all over the world paint murals on walls around the town. 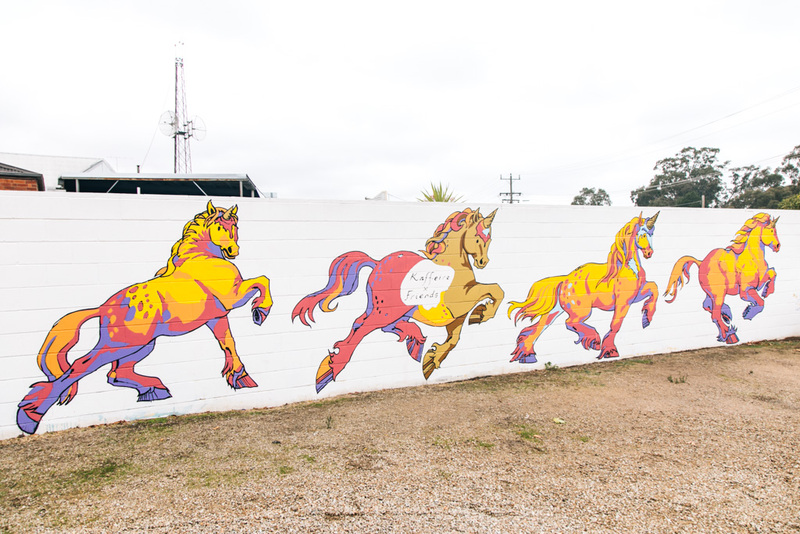 After 4 years’ worth of festivals, there are now over 50 murals spread out around Benalla which you can come see at any time of year, not just during the event. 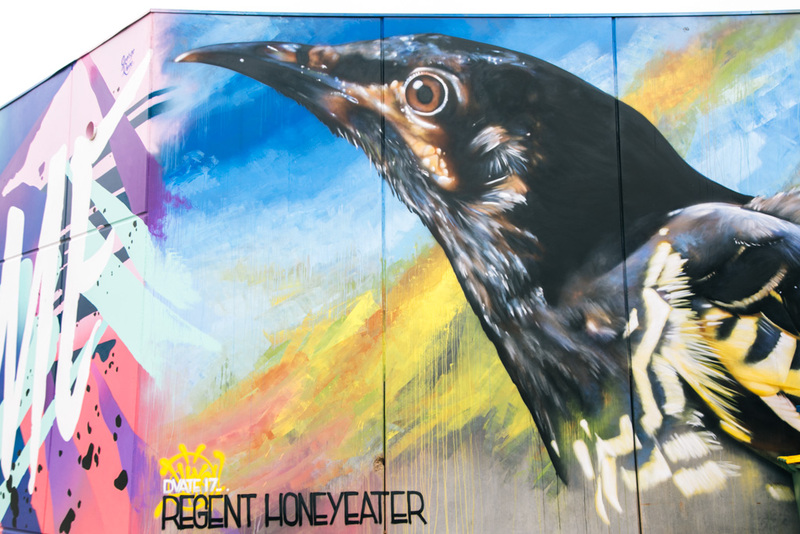 The town center is so compact that you can easily walk around and view most of the murals within an hour. 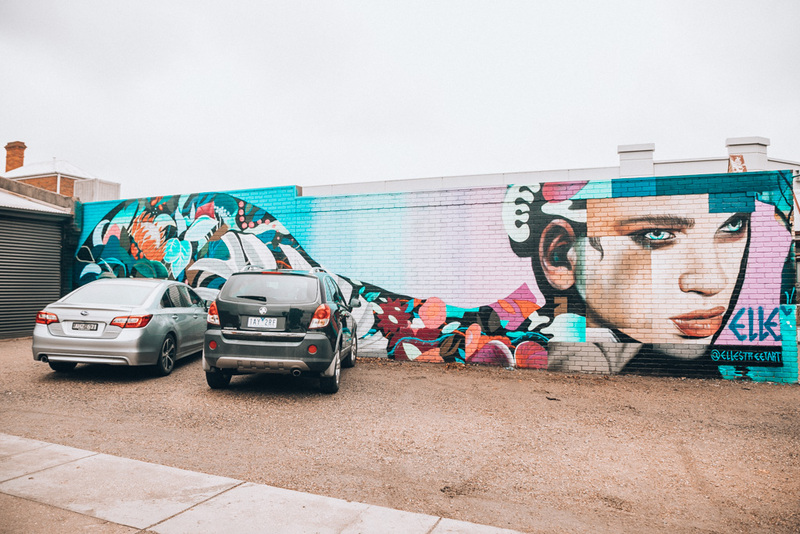 With this street art festival as its claim to fame, Benalla is openly vying to be the street art capital of Australia. I don’t see it taking the crown from Melbourne anytime soon, but maybe give it a few more years? 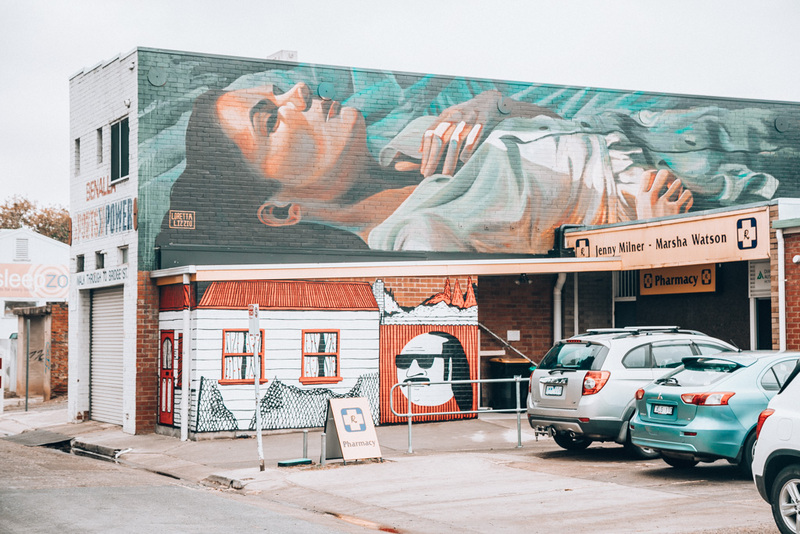 I’m not sure if Benalla on its own is enough to make the trek up from Melbourne, but combined with the silo art in Victoria nearby I think it makes for a fun day trip. 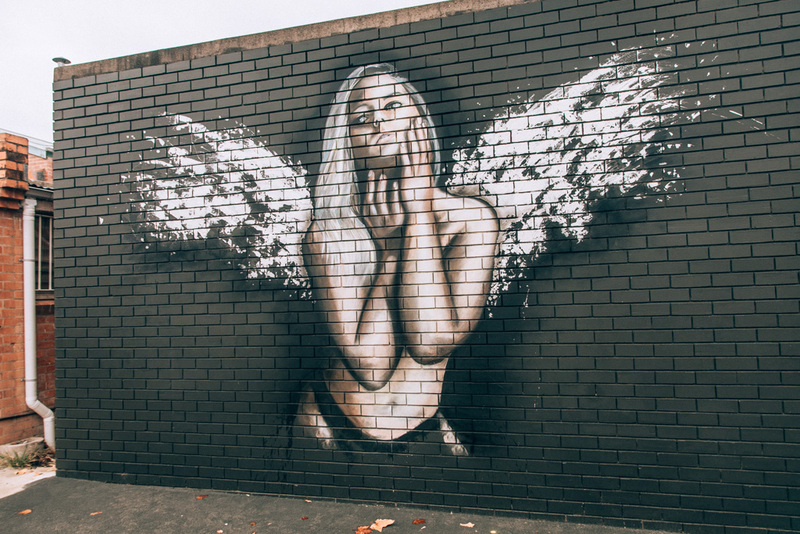 Definitely recommend if you love street art like I do!